Apprentice Kayla Crowther has posted a winning double at Sandown that included a victory on Terbium. Apprentice Kayla Crowther could not have wished for a better introduction to racing at Sandown, riding a double at her first two rides at the city course. Crowther guided $19 outsider Really Discreet to success in the Clanbrooke Racing Plate before hopping aboard $1.65 favourite Terbium to win the Le Pine Funerals Handicap on Wednesday. Both were prepared by Phillip Stokes who Crowther was indentured to in South Australia before following the trainer across the border to Pakenham. “You can’t ask for any more,” Crowther said of her first Melbourne double. Stokes has high hopes for both winners. Really Discreet was making her debut with Stokes already planning Oaks races for the filly when she turns three, while Terbium could be headed for a stakes race after Wednesday’s win. Terbium is unbeaten in three starts and Stokes said the Group Three Zeditave Stakes at Caulfield on Saturday week would come under consideration. “He’s still learning and that’s why I’ve been careful with where I place him,” Stokes said. 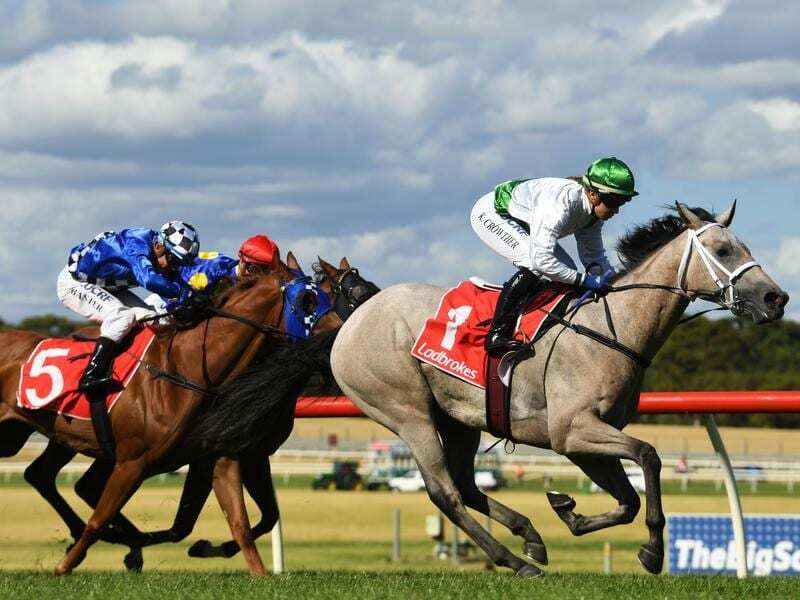 “He keeps improving and just loves it down at Pakenham, loving the environment. “It might now be time to test him in something stronger, so we might look at the Zeditave in 10 days or so. Like Terbium, Really Discreet was successful over 1300m on Wednesday and Stokes said the filly would appreciate stepping out in distance. Stokes trained the filly’s dam, Maybe Discreet, to win the 2013 Australasian Oaks at Morphettville and the trainer said Really Discreet is stakes class after coming from the tail of the field. He said the victory was better than expected, although the filly trimmed up in betting from $21 to $19. “We let her find her feet early and she showed a nice turn of foot so we’re very happy,” Stokes said. “She might have one more start and then we’ll turn her out.